Can-Am racers won multiple off-road championships in 2018, including the famed Dakar Rally and consecutive Best In The Desert series titles, making it another banner year for Can-Am racing. Team South Racing Can-Am duo Reinaldo Varela and co-driver Gustavo Gugelmin won the SxS category driving the Can-Am Maverick X3 Turbo R vehicle in its inaugural Dakar entry last January in South America. With five stage wins and a runner-up finish during the final stage, Varela-Gugelmin finished the Dakar Rally in a total time of 72:44.06, which was almost an hour ahead of the closest competitor. The tandem will defend their crown next year as part of the Monster Energy Can-Am racing team managed by South Racing. The other two driver / co-drivers on the squad are Casey Currie / Rafel Cordoba and Gerard Farrés / Dani Oliveira. More than 20 total Can-Am racing teams will compete in Peru for the ultimate Dakar prize in January 2019. Phil Blurton won the final race of the 2018 Best In The Desert series to secure back-to-back UTV Pro Production Turbo class championships with his No Limit RD-prepped Can-Am Maverick X3 Turbo R side-by-side vehicle. Blurton has gone from a virtually unknown rookie racer a in 2017, to a two-time Best In The Desert UTV champion in just two years in the desert scene. After the first round that saw Blurton finish off the podium, the determined pro racer never looked back and crossed the finish line physically first in every single race, winning four races and earning two runner-up finishes. Giving the BITD series a more global feel, Can-Am Maverick X3 pilot and Australian Brett Comiskey won the UTV Unlimited championship. Hunter Miller (Miller Racing Can-Am) won the 2018 XC1 Pro Turbo UTV championship, earning his first career No. 1 plate and the fourth in the last five seasons for the Can-Am factory team. Miller was the most consistent racer on the series earning five podiums in six races. Miller will go down in history as a GNCC Can-Am side-by-side vehicle champion alongside Kyle Chaney and his brother Cody Miller as GNCC has cut side-by-side racing from its series. Can-Am Renegade X xc 1000R ATV racer Kevin Cunningham won nine of 12 rounds this past season to earn his third straight GNCC championship, becoming the first three-time 4×4 Pro ATV class champion. Since the 4×4 Pro ATV class came into existence in 2014, Can-Am has won every title. In fact, Can-Am has won at least one 4×4 championship each year since it officially started competing in GNCC racing in 2005, making it the most dominant 4×4 ATV brand in the national series. Weller Racing Can-Am racer Corry Weller finished the 2018 Lucas Oil Off Road Racing Series strong by capturing the Production Turbo Championship. Weller piloted the No. 748 Weller Racing / Can-Am Maverick X3 Turbo R side-by-side vehicle to six wins on the season to capture the inaugural Turbo UTV championship. She also took home the Lucas Oil Regional Series season championship in her home state of Arizona. 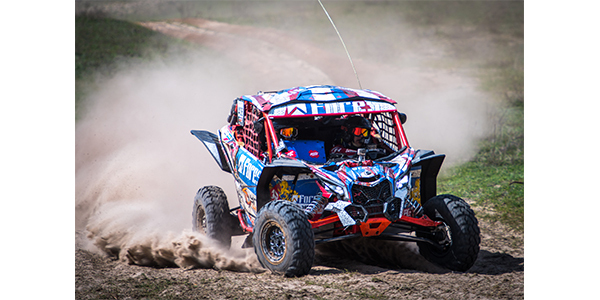 Kyle Chaney (Can-Am / XPS / CT Race Worx) won the 2018 Heartland Challenge UTV race in his Can-Am Maverick X3 side-by-side vehicle in Carlisle, Iowa. Chaney dominated the difficult four-hour, day-night endurance race that blends woods racing, short-course and endurocross obstacles. It was the second consecutive Heartland Challenge championship for Chaney. The off-road racing scene in Latin America has a large following and Can-Am racers did not disappoint in 2018, winning several big races, including the aforementioned Dakar Rally. The tandem of Bruno Varela (son of Reinaldo) and co-driver Gustavo Gugelmin won the Afrique Merzouga Rally in Morocco, Africa. Enrico Amarante and Breno Rezende took the victory at the Rally dos Sertoes, which marked the sixth straight title for Can-Am. Casey Currie, won the Desafio Inca championship with his South Racing / Can-Am Maverick X3 side-by-side vehicle as well this year. The BRZ (Brazilian) Cross Country Nationals championship was earned by Deni Nascimento and Idali Bosse, while Rodrigo Varela too home the 2018 BRZ Baja Nationals championship in a Maverick X3 side-by-side vehicle. Can-Am Maverick racers won all the titles and every round of the Nationals for the second year in a row. Belgian Marc Lauwers, and co-pilot Bob Geens, successfully defended Lauwers’ crown, piloting their Can-Am Maverick X3 race vehicle to victory in April at the 10th Annual 2018 Morroco Desert Challenge Extreme Rally-Raid in Northern Africa. Can-Am Maverick X3 side-by-side vehicle racing in the Australia and New Zealand region continues to grow and again had a successful year. Can-Am racers earned two championships in various series, including the Australian Off-Road Championship. Toby Whateley, who won the SxS Turbo class win at the celebrated Finke Desert Race, ended as the season champion. In fact, Can-Am racers took the top three spots in the season standings. David “Red” Loughnan won the 2018 Class 6 ARB Australian Off-Road Championship in his Can-Am Maverick X3 side-by-side vehicle. In its ninth season and continually growing, the Can-Am X Race Russia, is cross-country rally racing series that pits drivers, co-pilots and their vehicles against the elements and many obstacles in a three-race format to find true champions. It also offers four total SSV classes (based upon performance) and also a quad class. Anatoly Kuznetsov / Alexey Smolin finished fourth at the Chelyabinsk Region finale to earn enough points to win the Can-Am X Race SSV Standard class title in their Can-Am Maverick X mr 1000. Guided by the victory at stop one on the circuit and two additional podium finishes, drivers Azat Minnikhanov / Ilnaz Gizzatullin won the SSV Sport class championship in their Can-Am Maverick X3 X ds Turbo R. The relatively new SSV Super Sport segment was the largest SSV class. Sergey Karjakin / Anton Vlasyuk secured the season championship in their Maverick X3 X rs Turbo R by winning the third stage of the series. The SSV Absolute class title went to Artem Khairullin / Alexey Kuzmich, who, despite not earning an overall win, proved to be the most consistent, scoring enough points to earn the series championship. Racer Christian Böhnke (Moto Car Wiesmoor) won the German Side-By-Side Championship overall in his Maverick race vehicle. Böhnke won seven events to easily earn the series title.